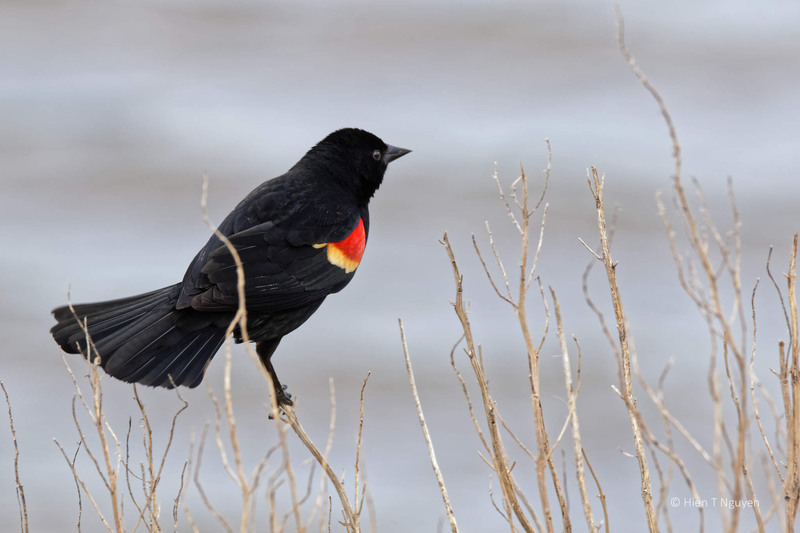 Red-winged Blackbirds, especially the male ones, are beautiful with their red and yellow wing patches. Fall is certainly here! The goldfinch is lovely, and it’s always fun to see blackbirds going after birds of prey – but it’s amazing that you were able to catch that moment. 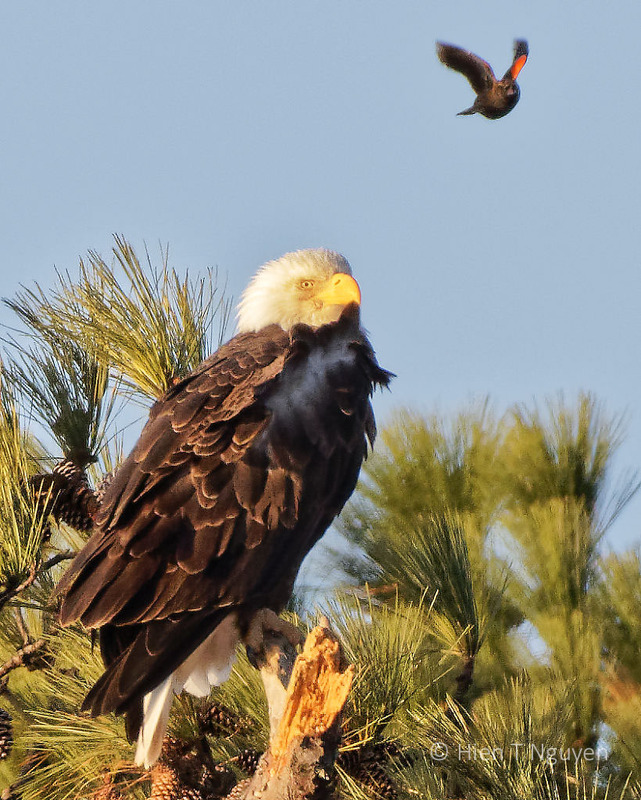 The blackbirds were mobbing the eagle, and when I took a shot that one happened to be flying right by the eagle’s head! These are beautiful photos and beautiful birds, as ever. Starlings were brought over to North America in 1890 and have now spread out everywhere. Your description of it is very accurate, especially their talent for mimicry. I’d never seen red-winged blackbirds until I moved to coastal NC. They are in our wetlands primarily. They sound just like starlings. Beautiful clear photos, thank you. Thank you! In the fall Red-winged Blackbirds and European Starlings often fly together, landing on the same bushes and trees, and I have to look carefully to distinguish between the two kinds. Always enjoy your bird images! 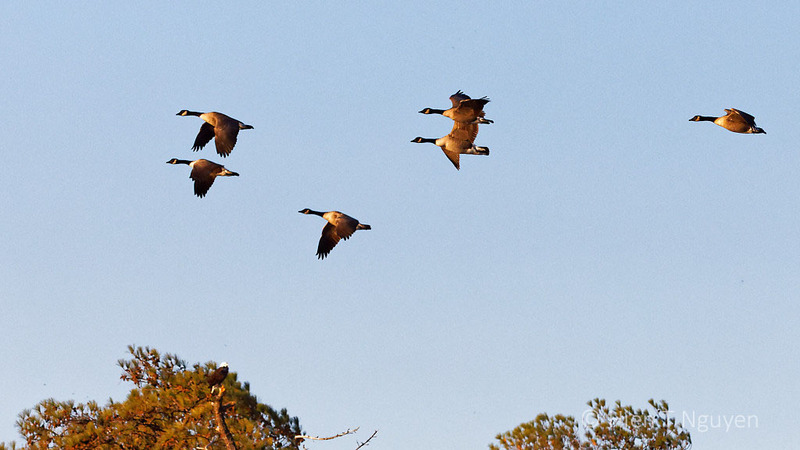 Geese in flight, what a cool capture! Thank you Amy! Canada Geese are fairly easy to photograph. There are so many of them! Thanks for taking us to Blackwater NWR, Hien. You reminded me that I saw one of my first wild great horned owls on one of these trees decades ago. And I am happy to see the refuge so alive with all these fine birds. Enjoyed the Forsythe birds too. Your photos, as always, are a joy to see, highlighting the beauty of each species. I have seen many blackbirds in my life (thankfully), but never a female so stunning as your photo here. The blackbirds mobbing the bald eagle gave me a smile. Thank you Jet! I am glad some of these photos bring back memories for you. Did you live on the East Coast then? No, I have never lived on the east coast, but I have had the pleasure of many visits there. 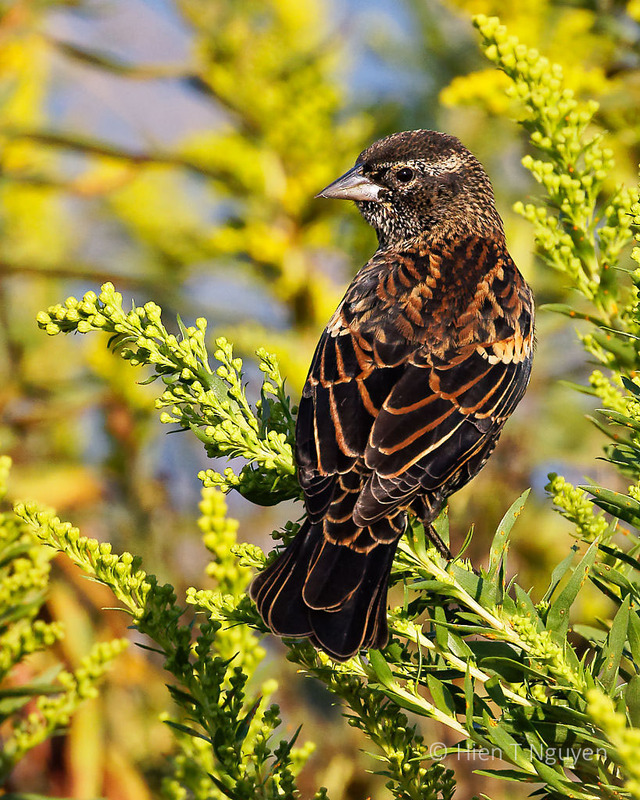 The female red-wing blackbird is so totally different from her mate. But her feathers are really very beautiful. Next time I see a red-wing blackbird I know now to look for the female. I did not know there was so much difference between the two. The female is not often visible, leaving the spotlight to the male which flies on top of bushes and trees, singing and defending its territory against perceived intruders. She usually stays nearer to the ground, minding her business. 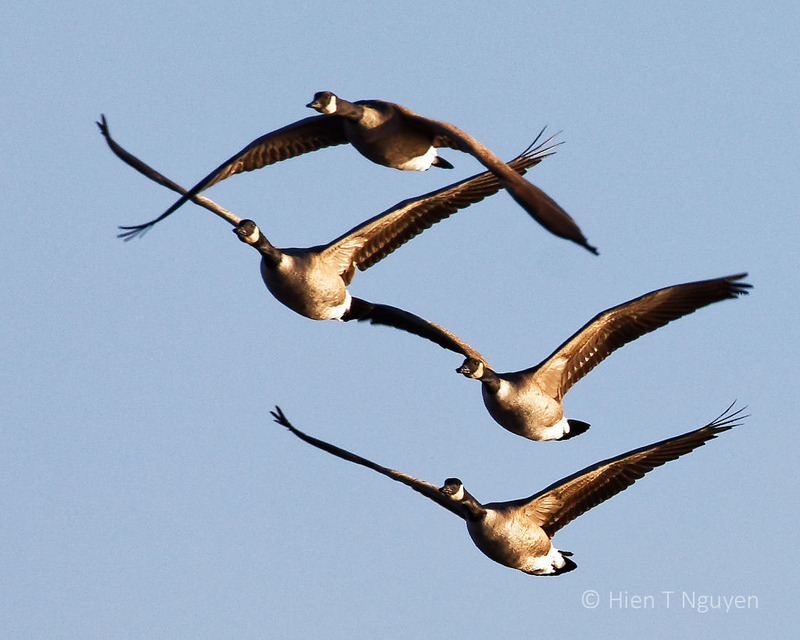 Beautiful shots, especially like the flying geese. You caught them beautifully! You wouldn’t believe how many geese there were. 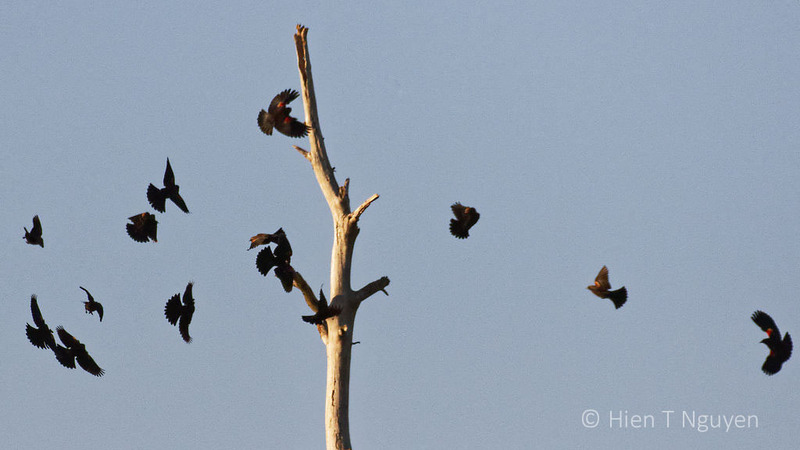 Every few minutes a skein would fly overhead, and if you miss one, there will always be another shortly. What a lineup of birds to photograph! Great photos. 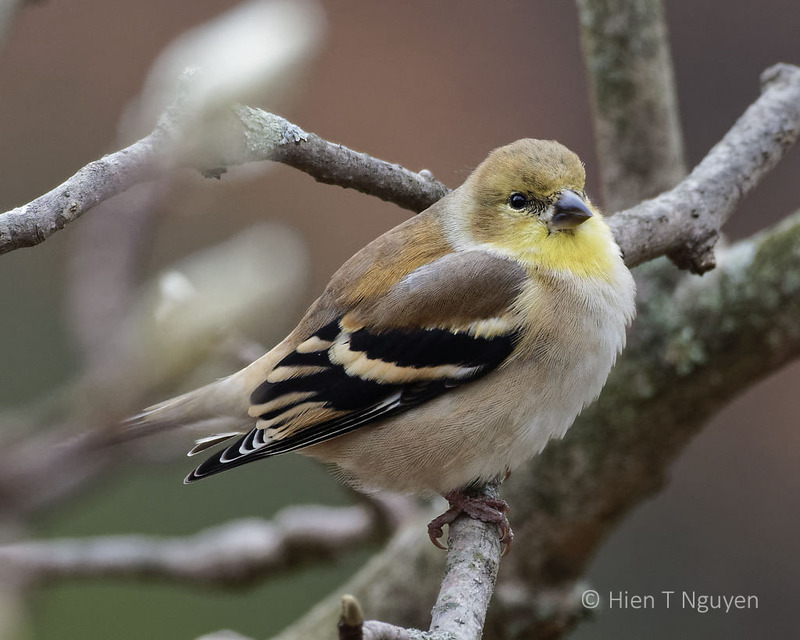 While I prefer to see the goldfinches wearing their summer colors because that means that it’s warm outside, I like their muted tones over the winter almost as much. Your wonderful images of them show that off very well. And no matter what time of year it is, it’s always good to hear them. I loved all the other images as well, especially the fearless RWB harassing the eagle. Thank you Jerry! The Goldfinches come to our bird feeder, sometimes as many as 10 at a time. They are a delight to watch all year round. Those RWB are really fearless, even against birds much bigger than them. Great captures, Hien. 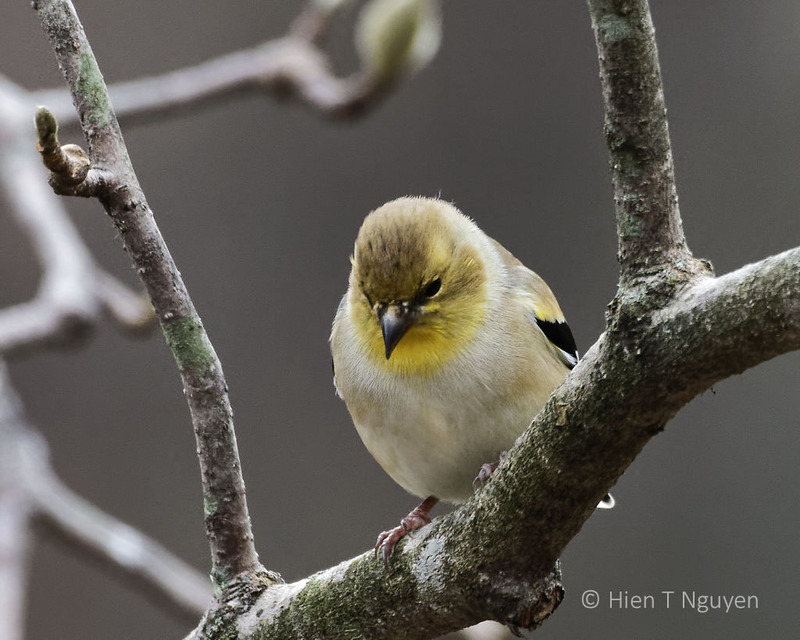 I find goldfinches to be so sweet and am glad to have them year round. The red wings we only see in spring and summer. They are my harbinger of spring. Thank you Eliza! The Juncos have made their appearance and will be around until March, April.